Everything depends on the forest. Everything I get is from the forest: school fees, food, water. I depend on forest for everything. That’s my ancestral homeland,’ says a villager. He is part of a 20-minute video submission to the African Court of Human and People’s Rights, requesting his ancestral homeland be returned to him and the Ogiek people, by the Kenyan government. For more than a hundred years the Ogiek have been facing oppression and evictions from their ancestral home in the Mau Forest. In 2009, MRG’s legal team received an email from Daniel Kobei, an Ogiek activist and currently director of the Ogiek Peoples’ Development Program (OPDP). He asked for MRG’s help in trying stop a plan to evict all those Ogiek who still remained living in the forest. MRG supported OPDP with a small grant to organize a campaign against the evictions. MRG also intervened directly with UN agencies, who conducted their own review of the situation, calling for respect of Ogiek rights. The short-term outcome was that the eviction plans were put on hold, but some community members had already been forced out, while others felt that a renewed eviction attempt could take place at any time. Buoyed up by MRG’s recent success in a similar regional case against Kenya, OPDP reached out to MRG for assistance and support with their own regional case, and litigation started before the African Commission for Human and People’s Rights (the Commission) in 2009. In 2012, the case was referred, under a new procedure, to the African Court of Human and Peoples’ Rights (the Court) on the basis that it showed serious and mass human rights violations – an indication of how seriously the Commission viewed the matter. The case was the first Commission-referred case to be heard by the Court and the first ever case concerning minority or indigenous issues that the Court has had to consider. In March 2013, a provisional measures order was issued by the Court in favour of the Ogiek. The provisional measures order required the Kenyan government to immediately reinstate the restrictions it had imposed on land transactions in the Mau Forest Complex (e.g. the sale of land or the issuing of concessions to use or log the land), and refrain from any act that might irreparably prejudice the main application, until the Court gives its final decision in the case. Even this order has not been respected by the government of Kenya. But while this was an important development for the Ogiek and the first order of its kind handed down by the Court, the Ogiek had to hear about it second-hand. That is because, while the case has major impacts for the lives of the Ogiek, when the case was referred to the Court by the Commission, it meant that formally the Ogiek are no longer a party to the case – and nor are OPDP or MRG. Instead, the Commission became the Applicant before the Court. This means that MRG and OPDP cannot directly communicate with the Court and had to rely on the Commission to conduct all the advocacy, which presented some problems. In one instance, the day that the provisional order was handed down, the Ogiek found out through a press release that the ruling had been issued. Therefore, none of the Ogiek were there in person to hear the ruling. ‘So there’s this whole question over the role of the original complainants due to the need to keep them informed and consulted,’ says Lucy Claridge, legal director of MRG. There were also some procedural aspects of the referral process which caused issues, since arguments on the merits of the case had not yet been presented to the Commission – following its procedure – but the Court didn’t take this into account and closed proceedings once they had received the files from the Commission, and the Commission had to ask special permission for the proceedings to be re-opened. This lack of alignment is emblematic of this new procedure, and MRG could see this was going to be a problem from the start. However, not being an Applicant before the Court, MRG could not communicate with the Court about it. MRG has had in mind throughout this process not only the community for whom this litigation is being carried out but also future generations of litigants who will need to use this procedure, and is keen that these problems should be ironed out. Since the Commission was inexperienced, it was a big learning process for them. In November 2014, 26 Ogiek representatives attended a two-day Court hearing in Addis Ababa. At the Court proceedings, witness evidence, expert evidence and the 20-minute video submission were presented. This was very impactful for the Ogiek: ‘For the first time we had a chance as a community to stand before the Court and tell them our plights,’ says Kobei. After the proceedings, the Kenyan government proposed trying to negotiate an amicable settlement; this proposal was accepted by the Commission, even though the Ogiek, OPDP and MRG did not want a settlement and did not believe that the government of Kenya would negotiate in good faith towards a solution that was in line with international standards. Again this raises the question of the role of the original complainants in a case referred to the Court by the Commission. This settlement negotiation process delayed and was dragged out through all 2015 and into early 2016. Eventually the Commission rejected the government’s terms for a settlement. In March 2016, the Court accepted the Commission’s request and decided to proceed with judicial consideration of the case. In October 2016, OPDP and MRG attended the Court’s 59th session and met with Court representatives, including Court President Oré, who stated that judgment is very likely to be delivered at the March 2017 session. While these cases were taking place at the African Court, there have been some continuing violations of the provisional measures order, with violent evictions of approximately 1,000 Ogiek in Nakuru county (resulting in one death), collusion between the perpetrators and the police, and police intimidation of the Ogiek. To ensure that these violations do not go undocumented, MRG has funded paralegal training for women and men in the community. Now people can defend their own rights in the community and they’re not depending on organizations. 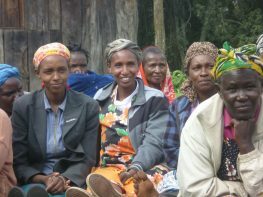 According to Eunice Chepkemoi, gender officer of OPDP, ‘Most of the members of the community have been experiencing land violations but, because of the knowledge which was given to them, they can now claim their land rights by themselves in court. They don’t have to depend on coming to the organization.’ This paralegal knowledge has allowed people to be more proactive in the community. Some paralegals have even engaged local politicians and participated in media events. Chepkemoi is also very appreciative of MRG’s efforts. ‘MRG has led to the visibility of OPDP both nationally and internationally. Also, because of the case we have at the African Commission, we really appreciate MRG. If it wasn’t for them, always supporting us, it could have been much more difficult to attain where we are now.